I see ALOT of wolf spiders here in Deltona, Florida but this definitely didn't look like any of the ones I've seen. It didn't have the dark markings on the top of it's body. Also this spider's legs were thinner and its "joints" seemed to angle it's legs in a different way- they weren't as low to the ground. At least that's what seemed to be the difference. 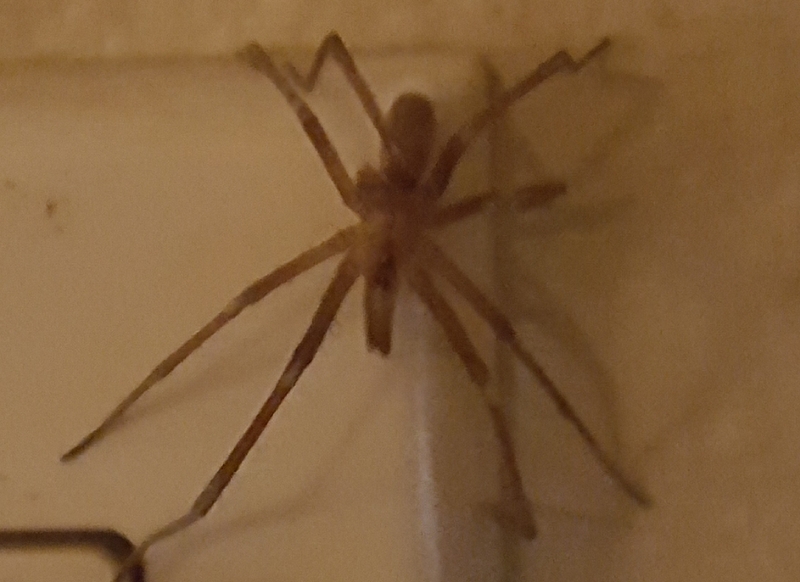 I found the spider crawling on the wall near the inside of my front living room door.I'm submitting this because I'm afraid it looks like a brown recluse spider. Afraid because it was in my home and I have cats. 4 days ago one of them suddenly had a very large open wound on his hind end. It was bigger than a 1/2 dollar, hard to explain the wound or how he possibly could have gotten it. A friend said it a really looked like a spider bite. I doubted it because I look up every spider I see in my backyard or my home and I've never come across one that's dangerous to my pets or to us. I couldn't count the eyes or photograph the genitalia but I was truly hoping you would have some insight, especially as to whether or not this resembles a brown recluse spider. If not a brown recluse I wonder if it looks like a spider that could be harmful to our cats or to us. Wow! That’s great! I don’t I don’t know if a flea prevention med would work. Ticks are arachnids, tick prevention meds might deter spiders from biting somewhat., I don’t know. It’s a new thing for me to research. I’ll let you know what I find out.